C-K Media services: Friends, not flowcharts. There’s one big truth in today’s media landscape: the consumer is in control. If you want to connect with them, it has to be on their terms. That has fundamentally changed how media works. At C-K Media (CKM), we think about media differently. If you want to change behavior and move the needle for brands, you have to think beyond the flowchart. From ratings to relationships. From channels to connections. You have to shift from output to outcome. So we don’t make flowcharts. When you’re focused on making friends, you have to think about media differently. Today’s media landscape demands true integration. At CKM, it’s all here – a proprietary programmatic media buying platform (with a unique DSP structure), paid, earned, shared and owned (PESO) marketing, social, SEM, consumer planning and data-driven analytics. With more than 90 people combining cross-discipline teams working together towards a common goal. No barriers. Totally interconnected. Whether you’re a media-only client or a full-service client, our media team brings a uniquely collaborative mindset that works seamlessly together as well as with your agency partners. We’re proud of our agent-only position. We never have and never will acquire banks of media time to resell to our clients. With CKM, you get the transparency you need on all of your media transactions – including programmatic. Successful brands thrive at the complex intersection of data and humanity. Statistics and data are most often about what happened in the past. Rarely are they insights into what’s next. Yet human beings aren’t static. Moods change. Lives change. Making friends requires a human interpretation and application of data. We make sure the insights from that data are applied well beyond media. When we say everything is digital, we don’t just mean media channels. Technology has changed the game in creating connections – from collecting and managing data, to activating programmatic channels, to orchestrating experiences. A deep understanding of technology is no longer a nice-to-have for media, it’s a critical need. That’s why CKM has built an infrastructure to help our clients make the most of marketing technology. If your insights are based off data from last year’s campaign, they’re about 12 months too old. CKM’s continuous optimization model is built for real-time insights. And because we’re a fully integrated team, we can take advantage of those insights in real-time, too. 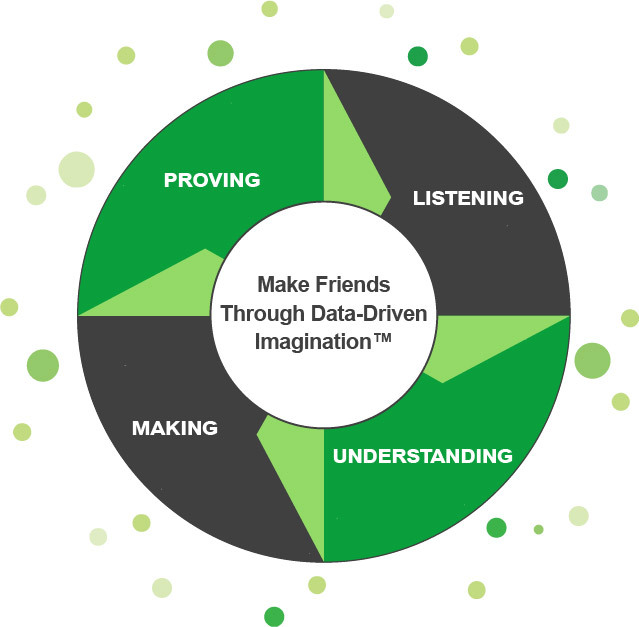 A Different Approach to Planning: The Friendship Model. Listening: Good friends take the time to listen. We dive deep to hear what our potential friends are saying in real time. Our approach to planning is all about creating lasting relationships between brands and consumers. Understanding: Good friends understand each other. We use data to uncover the human truth about our potential friends. This key insight fuels our connection strategy. It’s the spark that makes our strategy work and ignites our imaginative approach to media. Making: We activate the data and insights to find the right friends and build relationships for brands. Because we practice connected thinking, we understand how to work the entire ecosystem not just what we can buy. Proving: A friendship is only valuable if you can prove it. So, every connection plan includes measurable proof through custom analytics. CKM – A Very Different View of Success. CKM has a very different perspective on what will move the needle for you. We analyze each touchpoint along the consumer journey and determine what we call: The Point of Impact ROI. We isolate the absolute optimum moments of receptivity, moments most likely to produce behavioral shifts so that we can build programs of high impact with the highest probability of maximizing your media investment and content delivery, driving your business forward and impacting your bottom line. And we have the results to prove it.